The tax season is on, and most tax-saving investors would be doing their last bit of investments to reduce their tax outgo. One of their preferred options is the public provident fund (PPF), whereby investors get a fixed interest rate (currently at 8%) for investing their money for an investment horizon of 15 years. But what if we tell you that the same money, if invested in an equity-linked savings scheme (ELSS) for a similarly long duration, has the ability to generate relatively higher returns. 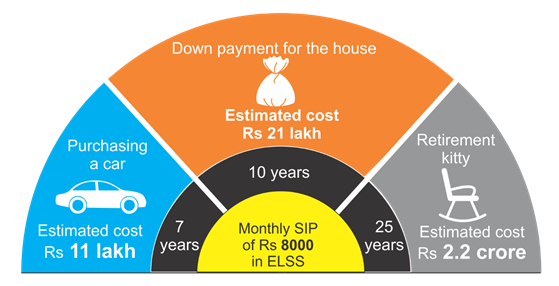 ELSS is a popular tax saving option under section 80C and have a statutory lock-in period of 3 years and up to Rs 1.5 lakhs can be invested in this scheme to qualify for tax deduction under section 80C of Income Tax Act. Let us look at this with an example. An ELSS mutual fund invests in the equity market, which, as represented by the S&P BSE Sensex, has given an average of 15% compounded annualized growth rate (CAGR) in a 15-years rolling period since its inception in 1979 till period ended December 31, 2018, as compared with just over 10% for the PPF during the same period. Meanwhile, inflation as measured by the consumer price index for industrial workers trended at ~8%. In terms of actual money growth, based on the average return numbers, an investment of Rs 1 lakh would have grown on an average to Rs. 8.14 lakhs in equity investments in a 15-years period versus just half of that at Rs. 4.17 lakhs in PPF. Why ELSS is best for more wealth creation for investors? Past performance is no guarantee of future returns and may or may not the sustained in future. 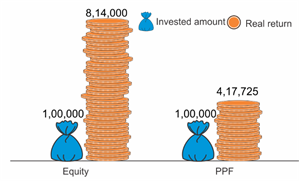 While we have taken PPF as a product for analysis, the bigger picture behind the story is that investors can utilize their tax-savings investment better by investing in higher rewarding products especially if they stay invested for the long term. ELSS funds^ have given on an average 17% CAGR returns in the past 15 years ended December 31, 2018 outperforming even the market measured by their benchmark - S&P BSE 500, which gave 13%. Further, by investing over the long term, investors also reduce the risk of short-term volatility from equity-based investments. Past performance is no guarantee of future returns and may or may not the sustained in future. ^ Asset weighted index created out of CRISIL ranked ELSS funds, Source: CRISIL Research. The Base date for the Index: June 01, 2001 and is Total Return Index adjusted index. Index portfolio marked-to-market on a daily basis using adjusted Net Asset Value (NAV) and 22 ELSS funds which are ranked under CRISIL Mutual Fund ranking are part of the index. Index values are calculated on daily basis using chain-link method. The index is compared to S&P BSE 500 since both are categorized as diversified. The funds considered by CRISIL for creation of index are based on minimum NAV history and a minimum AUM. The index will be rebalanced every quarter. In PPF, partial withdrawal is allowed post 6 years of completion. Maximum withdrawal is limited to 50% of the amount retained. Please refer to PPF guidelines and / or your tax / financial adviser for further details. As per Union Budget 2018, Long Term Capital Gains (LTCG) on equity-oriented mutual fund schemes are taxed at 10% (without the benefit of indexation), if an individual’s total capital gains cross Rs. 1 lakh in a financial year. Also, dividend distributed by equity-oriented mutual funds are taxed at 10%. The information in this leaflet is given for information purposes only. Investment in ELSS carries high risk and investors are advised to consult their tax/financial adviser, in view of individual nature of tax consequences, before taking any investment decision. Rate of return assumed – 15% (Average of annualized 15-year rolling returns of S&P BSE Sensex) It is assumed that the investments are done on the first Business Day of every month and calculation is done by using XIRR approach. XIRR helps in calculating return on investments given an initial and final value and a series of cash inflows and outflows with the correct allowance for the time impact of the transactions. The prime purpose of investing in ELSS is to reduce the tax outgo. But the corpus generated out of a prudent ELSS investment can also be used to fulfil key financial goals. Investors can sync their ELSS investments to attain goals across life stages such as building a retirement kitty, saving for their child’s education, buying a car or making a down payment for their house. Investors should, however, understand that ELSS is market-linked and does not offer guaranteed returns such as the vanilla fixed income tax-saving instruments. Hence, an investor should invest not only after reading the offer documents carefully but also considering his/her risk profile and conducting proper due diligence. Further, as per the current tax laws the proceeds from ELSS are subject to a 10% long-term capital gains (LTCG) tax (without the benefit of indexation) as compared to traditional instruments like PPF, which are tax-exempt on redemption. Investors should consider this factor although over the long term, the impact would be minimal on overall potential returns. Lastly, like with all equity investments, the best way to invest in ELSS funds is through a systematic investment plan (SIP) throughout the year. The corpus generated out of a prudent ELSS investment can also be used to fulfil key financial goals. This material is for general information only and not intended to be relied upon as investment advice and is not a recommendation, offer or solicitation to buy or sell any securities or to adopt any investment strategy. Recipient are advised to seek independent professional advice before making any investments. This material informative purpose only and it should not be construed as a promise on minimum returns and safeguard of capital. SBI Mutual Fund / SBI Funds Management Private Limited is not guaranteeing or promising or forecasting any returns. SIP does not assure a profit or guarantee protection against loss in a declining market. @In view of the individual nature of the tax consequences, each investor is advised to consult his/her own tax consultant with respect to specific tax implications arising out of their participation in investments. The tax rates are as per current tax laws and are subject to change.